And whilst at it, I made another two cards, exactly the same - tee, hee. So, that means I just managed to squeak in before the very end of June to reach my target of 72 cards to date (12 per month throughout the year). Oh, and of course I'd like to add this into Craftyhazelnut's Christmas Challenge Extra for June. So that was another two week session in the Playground. We're back to one week this time round though. - snippet of white linen card, die cut at each corner using an All Occasions die called 'Trellis Corner'. 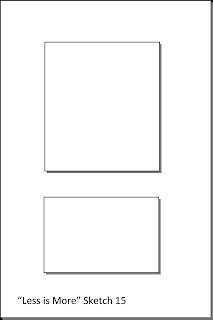 Tip, to place the die properly on each of the four corners I drew lines about a quarter of an inch in around each side of the card stock using a soft pencil so I could tape the die in place perfectly lined up each time and then rubbed the lines out afterwards. One thing I did and would not do again with this die was to back the white card with 'Stick-It' adhesive sheet before cutting the corners. It then took forever to get all of the little squares out of the trellis - and I'm still finding the little perishers everywhere! This truly must be the star pick of the week! 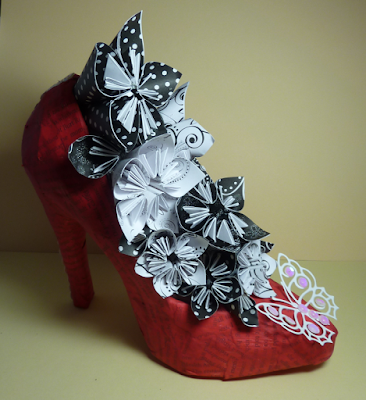 Kim made the most amazing shoe from cling film and Sellotape as a base (using a real shoe as a mould) and then decorated it with loads of snippety flowers. Do go and take a peek - there's also a bit of a step by step (ha, pun totally intended!) guide as well as tips on where to find on line tutorials. Wonderful work Kim! Mrs A scampered in waving this wonderful frame which contains a copy of a very special family photograph, again with some step by step instructions over on her blog. I just love this A4 sized card, made by Jackie T. Beautiful colours and again, a load of snippets here! I just had to include this Z-fold card, made by Sarah M (Craft Nerd). Squeal, have you seen all those little green snippets for the foliage? 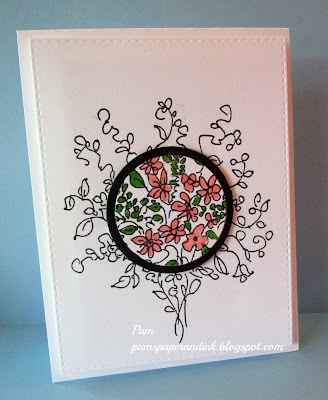 It's a really fabulous card and Sarah has kindly popped step by step photos on her blog post. Do go and see, and maybe a few of you will also follow Sarah - right now she only has five followers :( Surely we can do better than that girls? 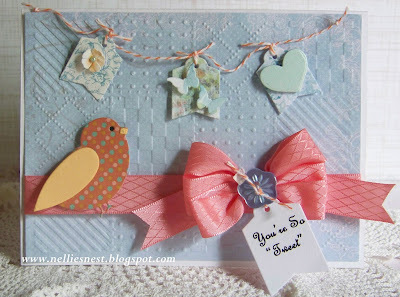 What a darling card, made by Diane H. Everything about it is just so 'right' - lots of snippets used and isn't that bow delicious?! And how about the chubby and happy looking birdie with the perfect sentiment too? I have to stop there, even though I could include dozens more of your wonderful snippets makes. 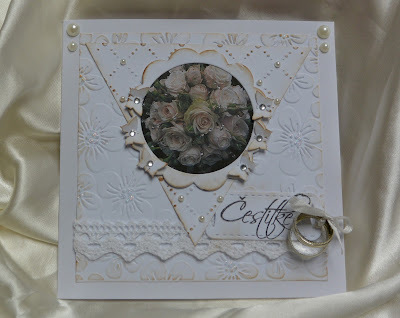 Valerija came back to play more than once, and this was her first entry - a beautiful WOW Wedding card. Pam skipped into the Playground waving this lovely card, I do love the 'spotlight' technique. Welcome to you all, and I hope you come back to play with us often! And would you believe it - Eve's winning entry was actually a House Mouse decoupage card - spooky or what huh? Well done ladies, I do have your addresses and will post off your stamp sets this coming week. 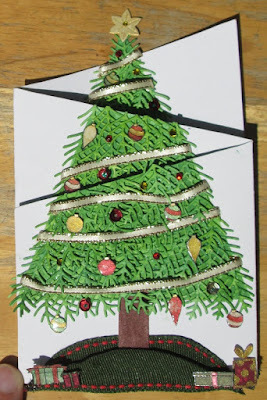 It's two dies - the first one is the same as the one I used today, All Occasion Dies 'Trellis Corner', and the other one is a Marianne Creatables Christmas Tree die (LR0136). As always, if you want to try for just one of the prizes then please say so in a comment and then I could do a second draw for the other die if you win. But, both dies are on offer together as one prize of course. 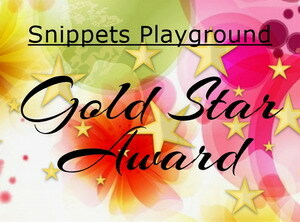 The Snippets Challenge will run for one week and the Playground gates will close at 11am UK time on Saturday 4th July. The gates will open again at midnight UK time on the same day. Maximum of three entries and please say in a comment if you wish to play and be a possible winner of all or part of the prize. Do remember that you should also link back to the Playground in your blog post to be eligible for the draw. I bought a couple of great 'House of Zandra - Fabulous Festive Fashion' stamp sets a little while ago but always fretted about the amount of colouring/detail on them. However, over at Merry Monday #164 the current theme is 'Gettin' Funky - create a card with a funky hat on it', so out came one of those NBUS stamp sets - yay! It's also Rudolph Day over at ScrappyMo's - where it's always anything goes. And you have until the end of the month to enter. Plus, it's 'Merry and Bright' over at Craftyhazelnut's Christmas Challenge #234 - and, over at Craftyhazelnut's Christmas Challenge Extra, it's always 'anything goes'. That brings my total number of Christmas cards made to 68. Am almost on track for the target of 12 per month, five days left to make another four :) I can see some batch work going on here! This card fits in with a few challenges, yay! First of all, the current Less is More challenge for week 229 is 'Stencilling'. Tick! Next, the current challenge over at Mrs A's Butterfly Challenge #33 is Butterflies + F is for Flowers. Tick! 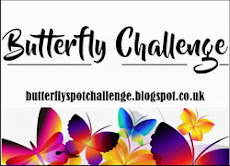 And also, there's a new monthly challenge which promises to be great fun - so this card is also for the Memory Box challenge #1 - Butterflies. 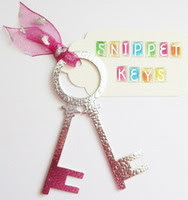 To enter you just have to use a Memory Box product - not difficult here for sure! Tick! Just a quick update to add in a couple of Snippets Playground runner up prizes, kindly donated by Darnell. On the left is a 2 piece stamp set by the very talented Ryn Tanaka (called School of Fish), and on the right is a 2 piece Gina K stamp set called 'Flower Border'. Two lovely stamps and all you need to do is to have entered at least one card/snippets make into the Snippets Playgound - and also leave me a comment on this post, saying you'd like to be in with a chance for a runner-up prize. I'm offering them separately to spread out the chances, so in fact it's two prizes. If you only specifically fancy one or the other (Fish or Flowers) then please say so as well. Otherwise I'll assume that either one would be fine. Remember the Playground is open until 11am on Saturday 27th June so you still have time to play. Super-fast card, once I found all the bits to make it with of course! 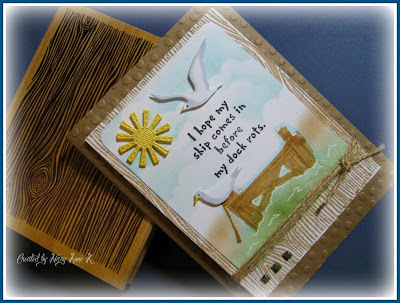 Tip for today - pre-made die cuts with dark backgrounds such as the sentiment on this card can sometimes end up with little white 'pips' where they've been attached to the (usually white or a light colour) main sheet of toppers. These can be trimmed off easily with small scissors, but sometimes there will be a little bit of white left visible so I just run a matching marker pen round the edge of the whole die cut. I use Whispers markers for this as Pro Markers just might bleed a bit. Failing that, a medium grey marker pen run right round the edge would probably work well either - just to take away any patchy white bits. My first pick this week was brought to the Playground by Annie, such a brilliant and economical idea for unmounted stamp storage - and great for using up those white snippets we all seem to accumulate! 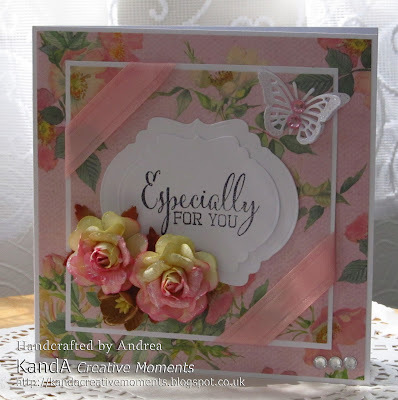 I just love this beautiful layered card, made by Andrea - it's so pretty and the background papers are just perfect with the dual coloured roses. Isn't this a great card?! 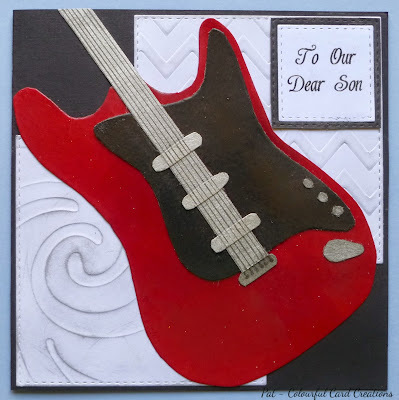 Perfect for a guitar lover or player, I know Len would be tickled pink if I made him a card like this one, which was made by Pat. Maura came to play more than once this week and this was her first entry - just beautiful isn't it! 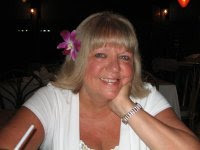 Welcome Maura and I hope you'll come back to play with us often! It's a Joanna Sheen set of three unmounted House Mouse stamps called 'Love Chocolate Heart'. Cute or what? And, I have two of these on offer - both exactly the same. This time, the Snippets Challenge will once again run for two weeks and the Playground gates will close at 11am UK time on Saturday 27th June. The gates will open again at midnight UK time on the same day. I'm sorry to mess folk about but I can't see me managing to do the Playground write-up on Saturday so feel it's best to let it run for a couple of weeks, which does seem to have worked fine recently. I hope this won't be a regular event though. Maximum of three entries (over the two week period) and please say 'Yes please' (or similar) in a comment if you wish to play and be a possible winner of the prize. I'll add some runner up prizes next Sunday (21st June) too. All prizes will be available to win with entries made over the coming two weeks. Di, and of course, Parsnip!